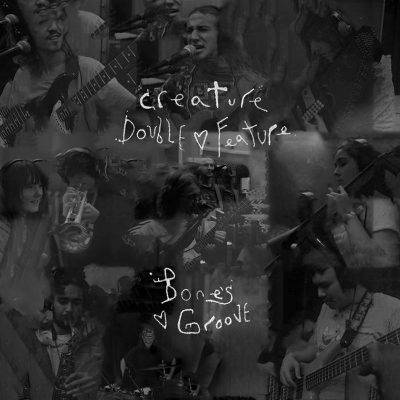 Creature Double Feature have released a new nine-track album, Bone’s Groove, which was recorded live in one day at Man v. Music by Mike Sasich. The band consists of Davis Johnson (guitar, vocals), Mason Johnson (vocals, guitar), Molly McGinnis (vox, autoharp, dulcimer), Stephen Bigelow (drums), John Hoang (bass), Tyler Webb (trumpet), Ivy Augusta Smith (upright bass), and Mr. Ghost (saxophone). The album ranges in genre from experimental psychedelic folk to jazz blues and indie-folk pop. The opening track “Heaven” is a dreamy song with a subtle background of distorted guitar and prominent saxophone. The steady drumming and vocal balance, which is tinged with subtle female backing vocals, add to the dreamlike elements of Bone’s Groove. At times, the music slows and pauses between the chorus, picking up speed but not volume at the bridge, before falling into a melodic electric guitar solo. Other times, the band is jazzy. “Sly’s Blues,” is slower, jazzier and bluesier. McGinnis harmonizes over softer male vocals, and they wail and croon together over the slow rolling drums and the quiet twang of the electric guitar and bass. The trumpet penetrates the song about halfway through, before the beat slows again shortly after, eventually making another appearance as the track fades out. Diverging from jazzy, “Swallowed Up” is a slightly uncomfortable experimental track. The song begins a cappella, with slight vibrato, then some normal drums and subtle trumpet and saxophone before slowing into an eerie display. There are quick, low-noted bows on the upright bass, with dramatic pauses and high-pitched notes on the trumpet as Johnson sings, “I don’t want to be swallowed up,” over and over again. The last minute and a half of the song fall back into normalcy with upbeat drumming and guitar. “God’s Insides” begins quiet and instrumental with dissonant notes played on the dulcimers, periodic electric guitar strums, and percussions. Maybe it’s metaphorical—like God’s insides are complex and moving every which way. After a minute, the song becomes Doors-like, with a handful of trippy instrumentation with the guitar at the forefront and a few distant, nearly monotone spoken vocals.